Remember this old sofa I bought a few months ago? Well, the week before I had Louisa, my reupholster delivered it and I LOVE it! It's every thing I wanted. When I first saw this super 60's Lee sofa on Craigslist with its scratchy seafoam green fabric, I thought, "The shape is great and classic. All it needs is some TLC". It was only $100 so I went down and sat on it and decided to buy it! I knew Lee is a good quality company and because this was made in the USA a few decades ago, it was made with hardwood and the previous owner seems to have hardly used it at all (we think it had plastic on it). The cushions are in great shape, I loved the length, the shape was perfect (though I still want an English roll arm sofa someday) and I like the three cushions - nobody has to sit in the crack! I was scared because I knew that I would have it reupholstered and the cost isn't cheap, but the finished product is so worth it! As I mentioned in my last post, I learned from experience (sad face) that white sofas just don't work for me (if you're able to make them work in your house with kids and/or pets, I salute you!). When we bought our last sofa from Ballard Designs, it was a white slipcover and I convinced myself that it was reasonable because I could just clean or bleach it! While that is true, I didn't take into account that I would have to wash it at least once a week to keep it looking nice (no thanks) and those slipcovers are a BEAST to get back on! It was also really uncomfortable and David and I both hated it so we decided to sell it on Craigslist before our move to Arizona. A week before we moved, William took a black Sharpie to one of the cushions and it was nearly impossible to get out! Someone recommended Lift Off 3, and it really did work great! I was able to get most of it out and sell it. Whew! Anyway, lesson learned. I have sworn up and down for years that I would NEVER buy a microfiber sofa. My experiences with it were in college apartments and overstuffed cheap quality. I knew it was easy to clean and very durable but I resisted. When I went on my search for fabric, I went down to Mesa Sales and spent a couple of hours looking through almost every kind of fabric there was. After talking to their special orders department about my options for fabric for someone with small kids (and adults who like to eat ice cream while watching a movie), they kept referring back to microfiber. I was so annoyed! Didn't they know it is soooo tacky?! Then, she said the words, "microvelvet" and I remembered one of my favorite rooms designed by Caitlin Creer with that awesome microvelvet sofa. When she showed me the dove gray swatch, I was sold. It is SO soft and looks like velvet. Yes, it still does that annoying mark that microfiber does, but I find that it doesn't bother me as much as I thought it would. I love the color. 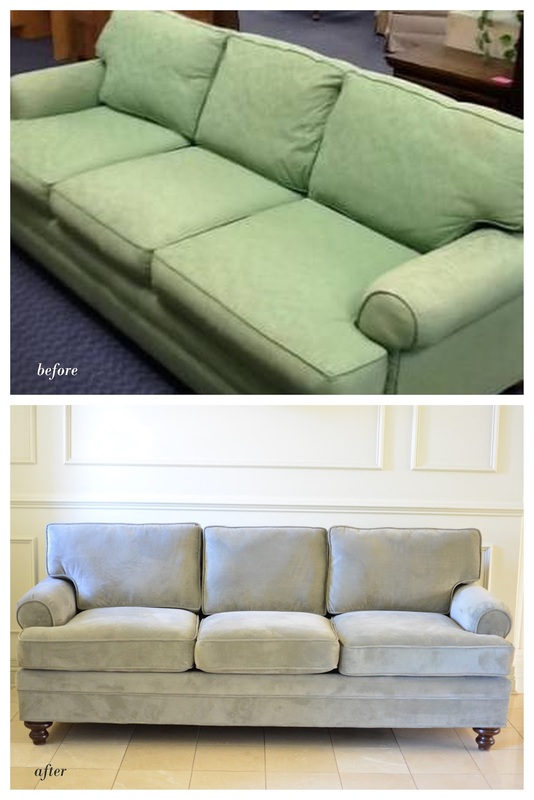 I love that it has already proven to be super easy to clean and I love how soft and comfortable this sofa is for 80% less than it would have been had I bought it new from Lee Industries. Definitely a big "ta-da"! Liz, your sofa is Beautiful. Wish I could see it! It is gorgeous!!! I also have a microvelvet sofa and it's is fantastic for toddlers with sticky fingers.